The title of this posting is not mine. It comes from Smart Money. They published it on October 25. The premise of the article is that recruiters mislead their candidates in many ways. I believe that the author, Will Swartz, was confusing low-end employment agencies with legitimate executive search consultants. I cannot speak for national recruiters. I cannot speak for recruiters in other businesses. I cannot even speak for other recruiters in the advertising business. However, for myself, this article is just plain wrong. In fairness, there are many different kinds of recruiters. We are executive recruiters. We work on assignments on behalf of our clients. We are not an employment agency. There is a big, big difference between executive recruiters and employment agencies. And I hate when clients refer to us as an "agency". While there is a grain of truth in what he says, I cannot agree with the essence of his article, that recruiters have an interest in not telling candidates the full truth about how they work and what they can and cannot do. One point in the article is important. Candidates should know who is representing them. They should know the background and reputation of the people who are working on their behalf. There are lots of good, reputable executive recruiters. I don't know how this article was researched, but they didn't talk to me. I thought about the best way to refute this article and decided that it was best to list his ten points and then respond to them. I think it is important for my readers to understand both how I work and how a good recruiter can work on their behalf. 1) "There are better ways to find a job" - This is a true statement. There are lots of ways to get a job. I tell my candidates that networking accounts for about 80% of all jobs. At best, recruiters account for an estimated 10-15% of all jobs (ads and postings account for the bulk of the rest). 2) "We don't work for you" - This is also a true statement. But in the context of the article it makes it seem that we don't do our best for our candidates. A good recruiter works for the people who pay them - their clients. I always tell my candidates that that I have to do a good job for both my candidates and my clients or I would be out of business. The article makes a point that because companies are already paying a fee to a recruiter, they are reluctant to negotiate for higher salaries. Not so. While I do represent my clients, if I think they are low balling the salary they are offering, I always tell them. There is always a little dance that gets done between recruiter and the company. The truth is that at most companies, particularly firms with over 50 or so employees, the recruitment budget is separate from the salary budget. One thing rarely has anything to do with the other. 3) "Until a year ago I was a car salesman" - This is also true. Candidates should vet their recruiters. Every candidate should know who they are dealing with and what their background and credentials are. Even when I first started recruiting in advertising, I had a twenty year history in the business, was well known and knew most of the ad agencies and companies I was working for. 4) "The job we advertised may not exist" - I can't speak for other recruiters, but we rarely advertise. Occasionally we may post something on the Ladders, but those jobs surely do exist. Every candidate has a right to know and ask questions about any listing. Reputable recruiters don't post fake jobs to attract candidates. 5) "We already know quite a bit about you" - I was actually horrified by this statement. I cannot conceive of real executive recruiters doing credit checks and background checks on candidates, particularly ones they have not met. We do not ask candidates to fill out applications or forms. I have never done a credit check on a candidate in my life. We see and meet 20+ candidates a week - the major recruitment firms see hundreds. We do conduct reference checks when appropriate. The idea of recruiters checking personal information is abhorrent. Perhaps this is done by some "agencies", but I doubt it. 6) "Our jobs aren't so hot either" - I am not sure how the economy or volume of jobs should affect the quality of recruiting. Or why big firms are more effective than smaller ones. Recruiters - of any size - get jobs of all types. The economy has not affected the quality of jobs, just the quantity. Candidates need to be able to assess jobs to determine if they are appropriate for them. A good recruiter should help candidates assess the opportunity and should never force a square peg in a round hole. 7) "You are at the mercy of computers just like on-line job board users" - All recruiters who use computers know their shortcomings. Key word search is and can be a problem. But not for candidates who are met and interviewed. Once again, I cannot speak for other recruiters, but we get to know our candidates and enter them into computers ourselves. Long ago I learned that key word searches are insufficient for the purposes of identifying our candidates. We treat each person who we meet as an individual. Many other recruiters do this as well. Key word search cannot cover all contingencies. 8) "The temp to perm carrot is rotten" - We rarely do temp jobs so I have no idea if this is true or not. But no recruiter should lie about the possibility of moving from temp to perm. 9) "If you have a job I could get you fired" - A reputable recruiter will never and should never send your resume anywhere without your express permission. Period. There is always the possibility in a job search that your current firm can find out you are looking, but a recruiter being the cause of that is so rare as to not even be a consideration. 10) "If I'm in Virginia, I will probably not help you find a job in Nebraska" - True. It is important for a candidate who wants to relocate to determine if a recruiter can help them find a job outside of the recruiter’s home market. Recruiters tend to work most in their home area. However, speaking for ourselves, we receive advertising assignments throughout the country. We have placed people in such faraway places as Birmingham, Alabama, Evansville, Indiana, Germany, France, London and Singapore. Many recruiters do not "market candidates" by making unsolicited calls to companies. Candidates should determine how their recruiter works and whether they can help them in other markets. Many recruiters, like us, have affiliates in other markets and other countries. This posting is what actually happened to a candidate a few years ago. And, yes, it really did happen. You can’t make this stuff up. The head of account management at an agency gave me an assignment to find someone to run a major car account. It was obviously a very senior job. I came up with a great idea for a candidate, Jim. I called him, got his permission to submit him and sent his résumé. The client and I agreed on a time and date for them to meet. The interview was confirmed and would take place on the following Monday at 10am. On Wednesday I briefed Jim. We discussed the job and I told him what to expect during the interview, and then I left for a long weekend of skiing. On Friday morning, at the end of my first run, I called my office to find a very distressed message from Jim. It seems that another recruiter had called him on this job, told him that he had an exclusive and that I could not represent the candidate. The candidate further went on to tell me that the other recruiter had insisted that only he was now representing my candidate and I was no longer involved. Needless to say, I was upset and quite perplexed. I immediately called my client and found out that, indeed, the new president of the agency (it just happened that week and had not yet been announced publicly) had given the assignment to another recruiter. The president was unaware of my relationship with the head of account management, who also happened to head the automotive account. My client (the head of account management) reassured me that I still had the assignment, that I was his preferred recruiter and he would be seeing my candidate on Monday morning as originally scheduled. He told me he would handle it internally and with the other recruiter. I called my candidate back, reassured him, reconfirmed the appointment and continued skiing. I wrote the incident off as merely an aggressive competitor and spent a lovely weekend in Vermont. On Monday, I had not heard from my candidate by about noon, which I took to be a good sign. Long interviews are generally positive. At a little after noon, Jim actually stopped dropped by my office since it was just a block away from the client’s office. Boy, was I surprised when my candidate told me why his interview ended more than two hours after the scheduled start. It seems that when Jim showed up for his 10am appointment, my client was unavailable and in another meeting. After waiting a few minutes, the administrative assistant came out to the reception area and asked my candidate why he was there. My candidate said that he had an appointment. “No,” the admin said, “you called me Friday and canceled.” He couldn't believe what he was hearing but immediately knew what happened. He, of course, had not made the call. He explained the situation. He was told to wait and, after a few minutes, was informed he would be seen at 11. When Jim told me what happened, I was as shocked as he was. Nothing like it has ever happened before or since. With Jim still in my office, I went to the phone and called the other recruiter’s boss, with whom I had had a long-term relationship. Her comment about her employee, “I guess he was being a little aggressive.” I was flabbergasted that another recruiter would permit this kind of behavior. If the offending recruiter had worked for me, he would have been terminated without any discussion. The end of the story is that all’s well that ends well. Jim got the job. I subsequently learned that the other recruiter actually sent an invoice to the president of the agency. He did not get paid. What I cannot believe is that the president of the agency continued to use the other recruiter. I have never understood why recruiters are not held to higher standards by the firms who hire them. What's The Big Deal About The GAP Logo? Long before I was a recruiter, I was an account guy. In many ways I still am one. So this post is about me wearing my advertising hat. I was away for much of last week and came back to the tempest in a teapot regarding the GAP logo. I have read many of the tweets, Facebook comments, the trade press and blog posts. As an advertising person, I don't want to comment one way or the other about the pros or cons about their new logo. Suffice to say that I am sure they had good reason to want to update it which most of us advertising people can guess at but not know for sure. I am delighted to know that GAP has achieved the status of icon brand - consumers wouldn't get this excited about just an ordinary brand. They clearly have a vested interest in the success or failure of the stores and products. That in and of itself is quite an achievement. So the fact that the redesign of the logo has generated its own buzz is not surprising. But, as we all know, designers can and will argue endlessly about the pros and cons of one design versus another. And we also all know that consumers will have their own opinions. Certainly, if the logo was allowed to stay, it would would become familiar to everyone and we would all get used to it. Which brings me to the point. What I do not understand is why the GAP would be swayed by the blogosphere. Surely, they know more about their business and their needs than the ardent bloggers, who mean well. Truth is, I believe it is no one's business, don't you? As I said, it is wonderful that people are passionate about the brand. But do people have a right to dictate how a company is run and how it presents itself to the consumer? Has marketing in this country been so taken over by public opinion that the experts - those at the companies who know their own needs best - must give way to public opinion? We all know that consumers cannot tell you what will be, only what is. In one of my previous postings, someone commented directly to me about Henry Ford's wonderful quote, "If you asked people what they wanted, they would have told you faster horses." Bloggers certainly have a right to express their opinions. A pro and con debate is healthy and may be good for GAP's business (I will bet store visits and sales have gone up this week). We all know that focus groups are misused and often misinterpreted. It is certainly fair for concepts, ideas and even new logo designs to be focus grouped, as I am sure the proposed new GAP logo was. But for goodness sake, for a corporation to be so intimidated by bloggers over the design of their logo is absurd. People have likened this situation to the recent Tropicana package redesign debacle. But, in my opinion, that redesign failed because it made the brand look like generic OJ. Some also likened it to New Coke, but that was a change in the taste of a well established product. This is completely different. This isn't life or death or even high fructose corn syrup. It is just a logo. I’d like to propose that ad agencies rethink the way they conduct employee orientation. New employee orientation gives every company a chance to establish a positive attitude and create enthusiasm among all its new hires, no matter who they are or what their level. Unfortunately, most orientations are totally process and procedure oriented. As constructed at most companies, orientation is all about rules, regulations and procedures - how many vacation days are allowed; how many sick days; dress codes (if any); health benefits. Insurance options are explained in detail. Policies about expense reimbursements, supper money and other very important procedural details are discussed. It is all boilerplate. And it is all necessary. Unfortunately, while all these things contribute to the smooth operation of the organization, there is a whole critical aspect missing from these nuts and bolts. It would be a wonderful time to really teach the philosophy of the company and its product. Orientation could be a perfect time to imbue new employees about exactly what is expected of them and what they can expect from the company. Orientation should be the critical time to teach the core values of any company. It should also be the perfect time to create excitement, a sense of purpose and enthusiasm among all new employees. What a great time to present the agency’s work in order to excite new employees. It is also a great time to provide history (Ogilvy still gives out David Ogilvy’s seminal work, Ogilvy on Advertising). All employees should be given a tour of the full office; if a company has a great conference room or editing facilities, all employees will be impressed by these features. This should be done for every level of employee from the most senior executives to the support staff. What a wonderful way to build morale and create a sense of excitement and community. If possible, new employees should meet department heads, be addressed by senior leaders of the agency and told what to expect. This doesn’t have to be done every week, but it is important for the long term that all employees have a sense of belonging. All too often I meet mid-level executives who have never met or even seen the senior executives of their company. This kind of orientation should be mandatory for all employees. Too many people get hired and are thrown right into the thick of things and are excused from their orientation. There is one other aspect of orientation which could and should be done and is rarely part of any orientation that I know of. Orientation should enable prospective employees to understand the expectations and the culture of the agency. It is a perfect time to explain to account people and creative people what is expected of them in their functions. I remember joining a wonderful creative driven agency as an account executive. I was given very clear marching orders: “Sell the work.” During my first week I was told that my job was to create rapport with my client so that they trusted me. That trust would enable me to sell the work. (I carried that advice with me for the rest of my account management career.) We were even told, “We don’t tell our clients how to make their products so they shouldn’t tell us how to make ads.” That was the marching order given to account people. Creative people were told to respect account people, get the objectives and strategy from them and then do great work. Account people were told to give creative what they needed and then leave them alone. The business is different now, but the point is that after that orientation, we knew what the agency stood for and it gave direction for our behavior. I know many executives who simply don't go to orientation. They get dragged into important meeting and never get formally exposed to the rules. Many people tell me that orientation is a necessary evil. Most people, whether they go to orientation or not, figure out their healthcare options and how to fill out an expense form. They even manage to figure out how many days off they are allowed. Orientation should serve a better purpose than that. It could be the perfect opportunity to reinforce a new employee’s decision to join the firm. Last night’s Mad Men hit home very closely. It was eerily personal. In last night’s episode, Sterling Cooper found out it had lost Lucky Strike, which was a product of the American Tobacco Company. It was their largest account. And, while we cannot know where the scripts in the last two episodes of the season take the program, it is clear from this episode, that the agency is poised for a tail-spin. It sounds all too familiar. So much so that it blew my mind. As I previously wrote, my dad had an agency. Until the late 1960’s it was called Lawrence C. Gumbinner Advertising. Their largest account was American Tobacco. They had, among other brands, Tareyton cigarettes. They had American Tobacco for thirty-five years. Tareyton billed, as I recall, about $40,000,000, which, even by today’s standards, was large, but by the standards of the mid-sixties, it was huge. And then one day they lost it – to BBD&O. After thirty years. And with no reason and with no review. It was just like Sterling Cooper last night, which lost Lucky Strike to BBD&O. While Roger Cooper found out that they were losing the account at dinner during the previous episode and clearly did nothing about it, including not telling his partners, in my dad’s case, it was a little different. My uncle and my dad were playing golf one summer Friday afternoon at Fresh Meadows, my uncle’s club. It was a rare occurrence for them to ever take a day off. A club employee drove out to them on the golf course to give my uncle an emergency message (clubs provided those kinds of services in those days) to call his client. You know the rest. Most people think that my dad’s agency did the “I’d rather fight than switch campaign”, for Tareyton but, without me passing personal judgment on it, I can say that my dad, my uncle and the other principals of the agency loathed that campaign. It was Jim Jordan’s work at BBD&O. The loss of the account was devastating to the Gumbinner agency, which, until that time, was the twentieth largest agency in the world. It represented about forty percent of their billings. It did not shut them down, but it was a devastating and surprising blow for the agency, especially since it came with no warning. I cannot wait to see the next episodes of Mad Men. We’ll see if it remains to be the same story as the one my family lived. 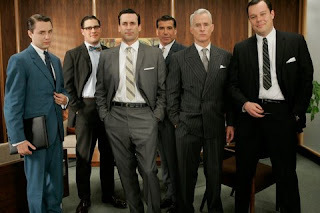 For more on my views of Mad Men, see my previous post.